This summer I visited New York City for the first time in my life. As always, when I travel the world, I have to look for any local whisky related experiences. This can be a bar, distillery, shop, festival, tasting or historical site. In the case of New York it turned out to be both a few bars, a couple of shops and a brilliant little distillery. The distillery in question was, as you will have guessed by now, the Kings County Distillery (KCD). 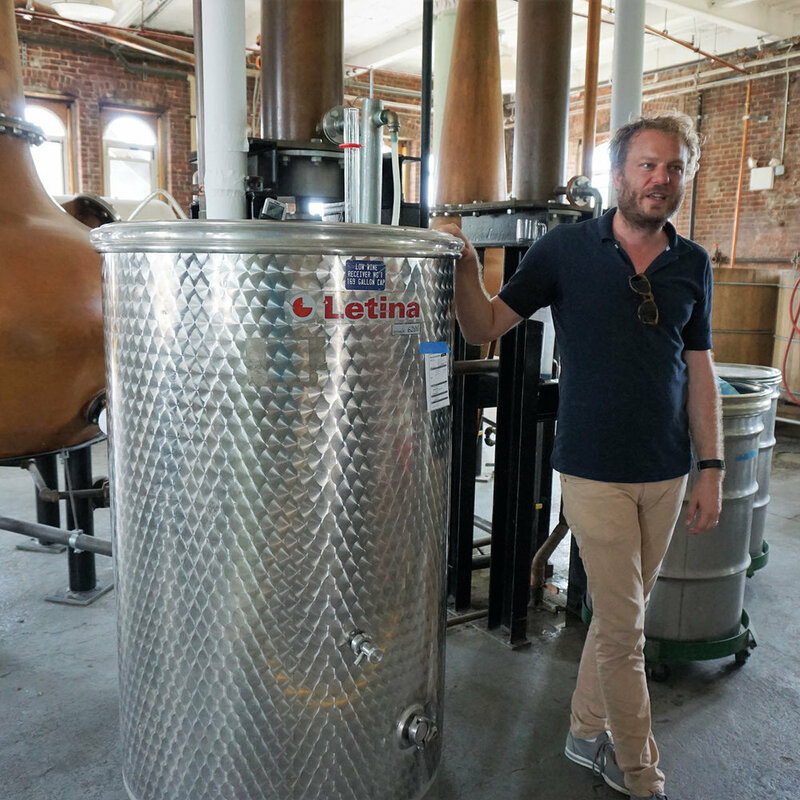 Founded in 2010, Kings County makes handmade moonshine, bourbon, and other whiskeys out of the 118-year-old Paymaster Building in the Brooklyn Navy Yard. We use New York grain and traditional distilling equipment to make distinctive spirits. In fact, they moved in to this historical building in 2012. The first two years were spent in cramped quarters in a roughly 30 square meters small room in East Williamsburg. I stayed at a hotel in mid Manhattan. Getting to the distillery was pretty straight forward. You just take the Metro to either York Street Subway Station or the Brooklyn Bridge Station, then walk for around 10 minutes. You can also take one of the many ferries over the East River. The walk from the pier to the distillery is around 20 minutes. You should book your tour beforehand. I booked The Behind the Scenes Tour at 25 USD, which turned out to be a great deal. The current site of the distillery is steeped in history. This is where the Brooklyn Whiskey Wars of the 1860s took place. Long before this, the earliest recorded distillery in the US was located nearby, on Staten Island. This was back in 1640, in what was then called New Amsterdam. In 1664 the English came in force, took charge, changed the name of the city to New York, and the demand for locally produced spirits sky-rocketed. Interestingly, the infamous gangster Al Capone grew up in the neighbourhood. I presume this is where he learned the value and potential of shady deals involving hard liquor. KCD has never produced and sold any other products than moonshine, whiskey and flavoured whiskey. No gin, vodka or the like. They started off selling moonshine, then launched a one year old bourbon. When they started up, they were the first distillery in New York City. Today there are more than 100 distilleries in New York state, and 25+ in New York City. In the US the total is now around 1500 - distilleries of all types (not just whiskey). The guide for the day was Colin Spoelman. He founded the distillery together with David Haskell. Colin gave a short introduction to the local history first, before we walked down to the production area. The first thing that stuck me here was that they use open top, wooden fermentation vats. Fermentation takes around three days in summer and around four days in winter. The resulting wash clocks in at around 6 % ABV. At KCD they use traditional pot stills (see image below). They run the wash still three times per day, and the resulting low wines have an ABV of 20 %. The newmake they produce is around 70 % ABV, but they then add a fair bit of water to bring the barreling/casking strength down to 58 % ABV. The standard mashbill at KCD is 80 % corn and 20 % malted barley. The production is currently at around 50 gallons per day. They have around 600 casks stored on-site, and a total of almost 3000 casks. Typical casks sizes are 5, 10 and 53 gallon. They mostly use small casks for now. The angels share is estimated at around 10 % the first year, then around 4 % per year thereafter. Moonshine infused with cacao husks, a bi-product from local chocolate production. As a weird super-bonus we got to try one of the odd experiments they have played around with at the distillery; distilled coca-cola. It was - hmm - interesting. In 2015, six leading New York State distilleries banded together to create a consortium dedicated to establishing a whiskey style for the Empire State - Empire Rye. KCD was one of those founding distilleries. Today 8 distilleries are producing and selling Empire Rye products, and a further 7 distilleries have committed to producing Empire Rye products for future release. The main requirement for Empire Rye is that a minimum of 75 % of the mashbill must be New York State-grown rye grain, which may be raw, malted or a combination. More info on Empire Rye can be found here. I ended up shopping a lot of various whiskey in the distillery shop - I bought a bottle of every single available product, except for the flavoured ones. On display in the shop was also two books, Dead Distillers and Guide to Urban Moonshining. Both books were written by the two founders of Kings County Distillery. Since I had Colin there, I went ahead and bought both books and had him sign them. Great stuff!